Talagai, N., Borz, S. A., and Ignea, G. (2017). "Performance of brush cutters in felling operations of willow short rotation coppice," BioRes. 12(2), 3560-3569. Short rotation coppice is an option for timely procuring biomass for use as a source of energy, but it often requires the use of expensive equipment. Small-scale farmers lack the ability to purchase such equipment, but rather can use their own affordable tools. 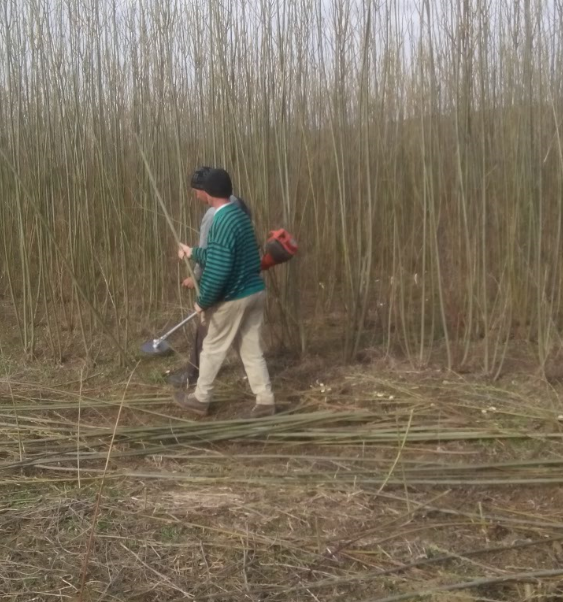 Performance of motor-manual harvesting using brush cutters in a short rotation willow coppice was evaluated by coupling traditional, Global Positioning System (GPS), and Geographic Information System (GIS) tools and methods. Strong dependence relations were found between the time effectively spent to fell willow shoots and the row length. The delay-free time consumption accounted for 81% of the total observed time, while the time spent to fell the shoots accounted for 97% of the delay-free time. The net production rate was low (0.13 ha h-1) being related to the technology used. Delays (19%) affected the performance resulting in a gross production rate of 0.11 ha h-1. Nevertheless, small-scale farmers use this level of technology in harvesting their crops by adapting the crop rotation to very short cycles, possibly to cope with technical limitations of brush cutters. The plantation system, layout, and the weather conditions may act as performance-limiting drivers. Also, adequate planning of the operational layout has the potential to increase the field performance. Biomass for use as biofuels or other bio-products can be procured from various sources, including forests, wood processing byproducts, and short rotation coppice (SRC). To this end, willow SRCs, can provide a steady and timely supply due to their general growth and yield characteristics (Dickmann 2006). This opportunity is coupled with the possibility to bring into production otherwise marginal agricultural lands and the possibility to generate noticeable revenues compared to the traditional land use. Moreover, this approach can take advantage of the know-how and technique transfer between countries that have extensive cultivation experience and those interested in implementing such practices. The first consistent experimental plots of willow SRC were established in Romania back in 2007-2008, and the practical experience has continued building, mostly in the central part of Romania (Scriba et al. 2014). Nevertheless, SRC cultivation requires several operations. Soil tillage, planting, weed control and fertilization, cutback, and harvesting are examples of specific operations (Van der Meijden and Gigler 1995). While operations such as soil tillage, weed control, fertilization, and cutback are typically performed using regular agricultural equipment (Tubby and Armstrong 2002), planting and harvesting operations usually require the use of special costly equipment. In particular, the harvesting operations account for the share of almost one third of the SRC life-cycle cost (Buchholz and Volk 2011). The harvester’s performance is one of the most important cost drivers, and it depends greatly on the plantation layout in terms of row length (Buchholz and Volk 2011) and the characteristics of standing stock (Eisenbies et al. 2014). Therefore, one approach aiming to improve the profitability of commercial SRCs is that of optimizing the harvesting operations (Buchholz and Volk 2011). However, under the conditions of small-scale SRCs, the farmers often lack the ability to form the critical mass needed to acquire the preferred equipment that would ideally be employed in the harvesting operations (Spinelli et al. 2012). Instead, they are adapting existing, general-purpose equipment to their needs and often decide to carry on the harvest manually (Schweier and Becker 2012a). Brush cutters are typically used in SRC cutback operations when dealing with small plots or in typical harvesting operations when the SRC is grown to produce propagation material for environmental engineering applications (Guidi et al. 2013). A typical practice in the Romanian willow SRCs is that of implementing very short rotations, which enables the use of available low-cost equipment in the harvesting operations. A common setup is that of felling the shoots using brush cutters, coupled with manual handling and small capacity chippers that are used to comminute the willow on-site. This most likely is an affordable option for small-scale applications especially when the labor cost is low. While the performance of commercial-scale planting (Manzone and Balsari 2014; Bush et al. 2015) and harvesting (Eisenbies et al. 2014) operations captured the attention of researchers, the performance of small-scale SRC delivery systems and of those using simple harvesting equipment have been less investigated. Some of the existing studies reported, for instance, on the performance of motor-manual felling using chainsaws (Burger 2010; Schweier and Becker 2012a; Vanbeveren et al. 2015). This study reports results on the field performance of motor-manual felling in willow SRC using brush cutters. In particular, the aim of this study was to estimate the performance of such operations by: (i) quantifying the time consumption involved by motor-manual felling including its variation in relation to operational factors, and by (ii) estimating the performance in terms of net and gross production rates. A field study was conducted in Spring 2016 in a SRC located in the central part of Romania (Fig. 1). The land was relatively flat, being located at about 600 m above the sea level (45°53’24”N, 25°59’19”E) near the Dalnic village (Covasna County). The SRC was established in 2013 using a plantation scheme of 0.75 m between rows and 1.50 m between twin rows. Cutback operations were carried out in 2014, and the SRC was in its first 2-year rotation harvest during the field study time. Observations were carried out for a harvested area of 1.8 ha. Harvesting was carried out motor-manually by two teams composed of two men each, having a fair experience in such operations. In each team, one worker operated a brush cutter, while the other one undertook the manual tasks. These consisted mainly of using a wooden stick to direct the stools while felling (Fig. 2). The equipment used by both of the teams was identical and consisted of an 8.7 kg Husqvarna 545 RX brush cutter (Husqvarna AB, Stockholm, Sweden) equipped with a steel saw blade. While the work teams approached the felling in smaller patches in the studied time period, the work organization was relatively simple. The felling consisted of the advancement of each of the work teams on a single row. Both teams progressed on the same twin row, at a distance that avoided the team’s overlapping. The general operational layout was that of progressing from the outer to the inner part of the standing stock, due to the technological limitations of such operations that require the stools to be felled outwards from the standing stock. In two cases, one of the work teams cleared short transversal paths to break the SRC into smaller work patches. This was required to reduce the operational length per turn and to cope, as much as possible, with the location of fuels and spare parts. The field data collection implemented procedures that aimed to get descriptive data needed to evaluate the performance of the motor-manual felling operations. In particular, two categories of data were collected from the field: data describing the growing stock to be harvested and time consumption data. Some of the variables were derived by computation in the office phase of the study. Four 10-m in length row segments were randomly chosen and marked to evaluate the inter-stool distance. On each of them, the distance between the stools was measured by a tape to the nearest centimeter and the number of shoots per stool was counted. Following the felling operations, the diameters at the cut level of each shoot per stem were measured to the nearest millimeter. Next, the cumulated diameter per stool was computed, at the office as the sum of the measured diameters. The height of the shoots was evaluated based on 140 individuals randomly sampled across the study area. A traditional production study (Björheden et al. 1995; Acuna et al. 2012) coupled with Global Positioning System (GPS) and Geographic Information System (GIS) procedures was implemented to collect the data needed in the performance assessment. Two researchers used professional chronometers and purpose-designed field-books, each of them observing a team, to continuously collect time consumption data. In addition, each of the workers conducting motor-manual felling operations were equipped with a handheld GPS receiver unit placed at the shoulder level and set to collect positions at an increased time rate (1 to 5 s). The observed operations were grouped in three categories of events, and time consumption data was treated accordingly. The time effectively spent on rows to fell the shoots was included in the on-row delay free time category. Headland turns, row entering, and exiting were grouped in the turning time category. Various kinds of operational, personal, and technical delays were grouped in the delay category. While the time study was as detailed as possible in the field, given the data collection method and the felling operational procedures, it was not possible to account for and separate some of the very short delays. However, such events were few and were caused mainly by remediating situations in which the shoots landed in the wrong direction. The collected time data was treated later, in accordance to its type. On-row delay free time was paired with the row lengths extracted from the GPS-GIS data, while the delay-free turning time was paired with the turns’ lengths. The row and turn lengths were extracted using the QGis (QGis project, qgis.org/en/site) environment, based on the available imagery of the SRC and the identification numbers of the field collected positions, by digitizing activities. The number of rows and turns was extracted from the GPS-processed data. Typically, the performance assessment of SRC operations is evaluated using objective indicators falling in both qualitative and quantitative categories. While acknowledging the availability of different terminological systems, including that related to agricultural machinery (e.g. ASABE 2011), this study used the conceptual framework specific to forest operations as described in Björheden et al. (1995). The performance was evaluated using field collected and office computed data. The on-row speed was computed based on the row lengths and the delay-free on-row time. A similar approach was used to compute the turning speed. The net production rate was computed using the area harvested in the observed period and the sum of delay-free time spent in felling and turning where the harvested area was extracted from the GIS environment. The gross production rate was computed using the total observed time instead of the total delay-free time. 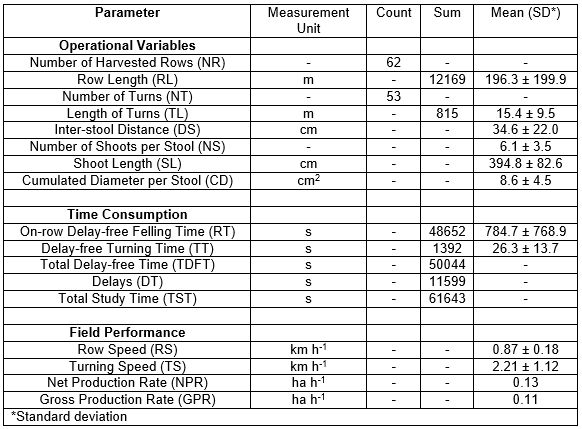 In this study, the time consumption of shoot felling operations was observed on a number of 62 single-rows having a total length of approximately 12 km and a mean length of approximately 200 m (Table 1). A number of 53 turns, row entering and exiting events, were observed and also included in the study. Such events were developed on a total length of approximately 0.8 km, averaging approximately 15 m (Table 1). The average inter-stool distance was approximately 35 cm (Table 1), possibly as a result of the technology used to establish the SRC. From the statistical point of view, a stool was characterized by the presence of about 6 shoots having an average height of approximately 395 cm. Also, the cumulated diameter of shoots per stem at the cut level averaged 8.6 cm ± 6.5 cm (Table 1). In the total study time, the delay-free time accounted for 81%. In the total delay-free time structure, the on-row delay-free time accounted for 97%, which indicated a small proportion of time being spent in turning events, that was related also with higher speeds of such events (2.21 km h-1 ± 1.12 km h-1). However, the turning speed exhibited a greater variation compared to the on-row speed which was of 0.87 km h-1 ± 0.18 km h-1. These figures affected the net and gross production rates as shown in Table 1, which indicated a net production rate that was 1.2 times greater than the gross production rate. The developed empirical models that describe the dependence relations between the on-row delay-free time and the row length, respectively, between the delay-free turning time and the turning length are shown along with their summary statistics in Table 2. The delay-free on-row time consumption was significantly affected by the variation of row length, which explained its variation in a proportion of 95% (R2 = 0.95). A similar effect was found in the delay-free turning time and the turning length dependence relation. However, the delay-free turning time variation was less explained by the variation of turning length, judging by the adjusted R2 statistic (R2 = 0.39). Nevertheless, the model, therefore the chosen predictor was significant at α = 0.01. This study aimed to estimate the field performance of motor-manual shoot felling in a 2-year SRC growing in its first rotation. Unfortunately, no comparative data was found on this particular kind of operation. However, Danfors and Nordén (1994) further referenced in Van der Meijden and Gigler (1995) described in their study a capacity of 0.17 ha h-1 for a Nicholson machine able to harvest whole stem bundles. Also, trials described by the Forestry Commission (1998) indicate performances in the range of 0.09 ha h-1 to 0.22 ha h-1 that included the allowances for operator rest and other work on site. Vanbeveren et al. (2015) concluded that manual harvesting of SRCs is less performant and more expensive compared to the mechanized one. Their study rated the performance of manual harvesting using chainsaws to 0.01 ha h-1 with a productivity of 0.15 t h-1. Also, Schweier and Becker (2012a) studied the performance of motor-manual harvesting using chainsaws and rated it to 0.12 ha h-1 for a 2-year willow SRC. As indicated by this study, the net harvesting performance when using brush cutters was rather low (0.13 ha h-1) compared with that specific to currently used, dedicated equipment, but it was comparable with that of using other motor-manual alternatives (Schweier and Becker 2012a). Recent studies (Schweier and Becker 2013) reported field performances of harvesting operations in the range of 0.51 ha h-1 to 0.97 ha h-1 for forage harvesters. Also, Schweier and Becker (2012b) reported field performances of 0.47 ha h-1 when willow SRCs were harvested with equipment capable to cut and store the biomass. They also pointed out that such an option would be more flexible, but it resulted in greater costs compared to cut and chip systems. Nevertheless, an operational option, such as that described in this study, includes affordable equipment that could be virtually purchased, transported to the harvesting site, and operated by most small-scale farmers. If the intended use of harvested biomass is to produce woodchips, then additional equipment would be needed for handling, transportation, and comminution. According to the local practice, manual handling is used to move the felled shoots on short distances to a chipper brought in the field for comminution purposes. However, the manual handling and comminution were carried out several weeks after the felling. An advantage of deploying such operations was that of not being technically constrained by the need to leave cleared headlands to allow the access of farming equipment that may account for 8% of the field area (Buchholz and Volk 2011). Hence, they enable the full use of the field for plantation and biomass recovering purposes and represent a good fit for small-scale holdings. No cost assumptions were made in this study. However, harvesting costs of the currently used performant machines seems to be unaffordable for small-scale farmers in Romania at the time. This may have come as a result of the general context in which the manual workforce is still available at very low costs. For instance, in the studied conditions the workers were paid on a daily basis and the labor costs were estimated to about 2 $ per worker h-1. Then, most of the Romanian SRCs are established on small yet widespread areas. The inter-stool distance, shoot size, operational layout, workers’ fatigue and the local weather conditions may act as drivers affecting the performance in operations such as those described in this paper. In theory, an increment of inter-stool distance from 0.35 m, as reported in this study, to 0.59 m as being specific to most of the commercial standards, would translate the on-row advancement speed to about 1.5 km h-1 with an increment of field performance to approximately 0.2 ha h-1 and a performance gain of more than 50%. Of course, this assumes similar characteristics of the standing stock in terms of biometry as the brush cutters may be technically sensitive to the diameter of shoots at the cutting plane. While this study described a particular condition, from this point of view, experimental studies should be carried out to delineate the effect that rotation length and shoots’ size may have on the field performance in similar operations. Also, further research is required to determine how the motor-manual workers could align their physical and operational capabilities to higher advancement speeds given the fact that most of the motor-manual operations generate increased fatigue and are less safe. A good planning of operational layout has the potential to drastically reduce the delays (18% of the total study time). This problem should be addressed by programing using constraints, such as the plantation layout, advancement speeds, fuel consumption, and spare parts replacement. Motor-manual felling of SRCs yielded a lower performance compared to that specific to dedicated harvesting equipment. However, it fits the needs of small-scale farmers by its low investments in equipment, full utilization of the field, and relatively easy to use procedures. Nevertheless, the final harvesting costs may be affected to a great extent by the variability of labor costs in various regions while the technique could be less safe compared to the use of mechanized equipment. There is still room for performance improvement of motor-manual felling by excluding those delays produced by an improper organizational layout. Such issues should be addressed by programing following a deeper understanding of the overall system’s performance. There are some technical limitations of the studied felling procedures that delineate their operational range. Brush cutters could be sensitive to the variation of size characteristics of the standing stock, specifically to those related to the shoots’ diameters. Also, hard winds may impede the felling operations. The authors would like to thank to Mr. Marius Cheţa for his help during the field data collection activity. Also, the authors would like to thank to Mr. Arpad Domokos for making this study possible. ASABE (2011). “Uniform terminology for agricultural machinery management,” ASABE Standards, S495 DEC99, ASAE-The Society for Engineering in Agricultural, Food, and Biological systems, St. Joseph, MI, USA (http://www.nrcs.usda.gov/Internet/FSE_DOCUMENTS/nrcs143_009472.pdf), Accessed 28 December 2016. Acuna, M., Bigot, M., Guerra, S., Hartsough, B., Kanzian, C., Kärhä, K., Lindroos, O., Magagnotti, N., Roux, S., Spinelli, R. et al. (2012). “Good practice guidelines for biomass production studies,” CNR IVALSA Sesto Fiorentino [National Research Council of Italy – Trees and Timber Institute, Sesto Fiorentino], p. 51 (http://www.forestenergy.org/pages/cost-action-fp0902/good-practice-guidelines), Accessed 28 December 2016. Björheden, R., Apel, K., Shiba, M., and Thompson, M. (1995). IUFRO Forest Work Study Nomenclature, Swedish University of Agricultural Sciences. Department of Operational Efficiency, Grappenberg, 16p. Danfors, B., and Nordén, B. (1994). “Logistics for Simultaneous Harvesting and Cutting of Short Rotation Energy Forest,” Swedish Institute of Agricultural Engineering, Uppsala, Sweden. Forestry Commission (1998). Harvesting and Comminution of short rotation coppice. Harvesting machine trials. Technical Development Branch. Technical Note 8/98. Forestry Commission, Ae. (http://www.forestry.gov.uk/pdf/FR_BEC_Harvesting_and_comminution_of_short_rotation_coppice_TN898_1998.pdf/$FILE/FR_BEC_Harvesting_and_comminution_of_short_rotation_coppice_TN898_1998.pdf), Accessed 28 December 2016. Schweier, J., and Becker, G. (2012a). “Motor manual harvest of short rotation coppice in South-West Germany,” Allgemeine Forst und Jagdzeitung 183(7-8), 159-167. Scriba, C., Borz, S. A., and Talagai, N. (2014). “Estimating dry mass and bark proportion in one-year shoots yielded by one-year Salix viminalis L. plantations in Central Romania,” Revista Pădurilor (3-4), 57-66. Tubby, I., and Armstrong, A. (2002). Establishment and management of short rotation coppice. Practice note, Forestry Commission, 12 p. (http://www.forestry.gov.uk/pdf/ fcpn7.pdf/$FILE/fcpn7.pdf), Accessed 28 December 2016.
van der Meijden, G. P. M., and Gigler, J. K. (1995). Harvesting techniques and logistics of short rotation energy forestry. A descriptive study on harvest and transport systems in Salix production currently used in Sweden. Swedish Institute of Agricultural Engineering, Ultuna – Uppsala, JTI rapport 200, 49 p. (http://www.jti.se/uploads/jti/JTI_Rapport_200.pdf), Accessed 28 December 2016. Article submitted: December 29, 2016; Peer review completed: March 12, 2017; Revised version received and accepted: March 19, 2017; Published: March 28, 2017.